First I want to wish you all a Very Happy, Healthy and Productive New Growing Year! It's amazing just how even just the smallest little bit of increasing light can make you want to 'earth yourself' by getting plugged into the soil again! It's only a few days since the winter solstice but already there's a noticeable stretch on the brighter days. It may be my imagination but the birds seem to be singing more loudly and the plants in the polytunnel also seem just a little bit brighter too! Or is it wishful thinking? It's not too long now until the mad spring rush of sowing and planting is here again. For now though - things move at a more leisurely pace - but there are still some things you can sow and do this month if your gardening fingers are itching to get back into compost, like mine are and you want to get ahead just a little bit! It's surprising how many things there are that you can sow now. There are quite a few things you could sow now or towards the end of January in pots or modules for planting out later in a tunnel, greenhouse or sheltered cold frame. You won't gain a huge amount by sowing too soon though. By leaving it for another couple of weeks the light will be increasing, so seedlings will be sturdier, will get a better start and you'll use less energy. Most seeds will germinate at normal house temperature - and as things take a week or so to appear anyway - you can sow some things inside the house and then put them out into good light in a greenhouse or frame as soon as the seedlings are up. Seedlings like lettuce, spinach and hardier salad plants will be fine then, with just some protection from frost with a couple of layers of fleece. Light governs their development to a great extent - so you can save money and energy by not wasting any heat needed for another couple of weeks yet - no matter how keen you are. Don't forget you can also do your seed sowing inside in comfort on the kitchen table - there's really no need to go outside in the freezing cold unless you're a masochist! In my over 40 years experience I've found that using a good organic peat-free seed compost is by far the best and most reliable choice for sowing everything - not just from a plant health point of view but also for environmental reasons. Any extra expense is well worth it in terms of valuable seeds and seedlings not lost. After sowing - put your seed trays or modules somewhere in your house at average room temperature - and most seedlings will be up within a few days or a week. I find seeds like lettuce take about 3 days at normal cool room temperature - they don't need a lot of warmth. Make sure to put them somewhere where you will remember to check on them twice a day, as seedlings like lettuce can become leggy very quickly if not given good light immediately. Once they have germinated, probably in a week or so for most things at this time of year, they will then need the very best light you can give them - which means either a tunnel, greenhouse or perhaps a cold frame against a south facing wall. 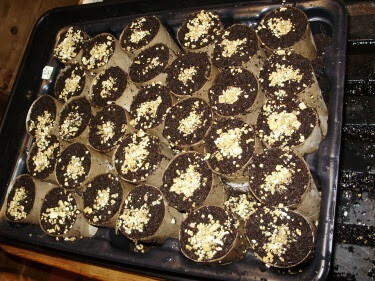 They also need very good air circulation - so sowing in modules either individually or in 2's or 3's to thin later is the best option - as this avoids handling vulnerable seedlings which may result in possible 'damping-off'. It's too wet, windy and cold for tiny seedlings to be outside completely unprotected at this time of year but if sheltered from the weather most are fine as long as no frost is forecast. If it is - then bring them into the house again on very frosty nights and put them out again first thing in the morning. This may seem a bit of a faff but it's worth it. Sowing too early on windowsills often means unhealthy, leggy and drawn seedlings due to lack of light. If you don't have a greenhouse, polytunnel or frame outside, I would wait another couple of weeks yet - even if like me you can't wait to get started! Although some more tender heat lovers like tomatoes etc would need a warm propagator, I don't waste heat by sowing tomatoes in a propagator yet, as even those sown in another month will catch up and probably be healthier than any sown now! Having said that though - as I already have a source of bottom heat of about 10 deg C on top of the large insulated dog crate in which I'm rearing chicks this year - I may just chance sowing a few Maskotka bush tomatoes, as it's always my earliest and hardiest tomato. Luckily, it's also one of the tastiest - and I'd love to see if I can get it to ripen even earlier than the first week in June, when it's normally reliably ripe! Remember - the suggestions below are for things which you could sow now if you want to - NOT things you HAVE to!! You could sow - early carrots in long modules like loo roll middles as I am doing in the picture above. Sit the modules on 1/2 inch compost in something deep like a recycled plastic mushroom box to keep them upright, (approx. 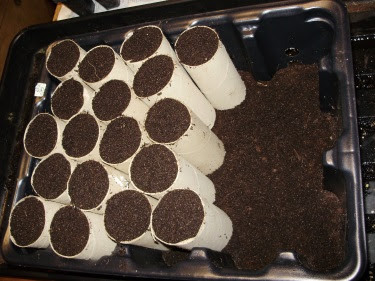 32 loo roll tubes fit into a mushroom box) - fill them - and the gaps between them - with seed compost - then sow a tiny pinch of seed into each covering with vermiculite. Make sure the cardboard rolls don't stick up out of the compost or they will act like wicks - drawing out moisture and drying out too much - which means they could then shrivel and kill tiny roots. These will be ready for planting out in the tunnel in clumps - each about 30cm apart - probably at the end of next month when they have 2 'true' leaves. Also early broccoli (I grow 'Green Magic' a productive early variety), 'Ragged Jack' & 'Cavolo Nero' kales for baby leaves, spring onions, lettuces, broad beans, early and mangetout/sugar peas, green and red 'frills' mustards, mizuna, oriental mixed greens, beetroot, Swiss chards, salad leaves, radishes, and rocket. At the end of the month you could sow tomatoes if you want an extra early crop - but bear in mind that they will need not just potting on at least once but will also keeping warm for several weeks before eventual planting out. They must also be in very good light - or they will become drawn and 'leggy' - and therefore more vulnerable to disease. (Tip - a well known correspondent with the Irish Times told me that he raises his early ones in the warm under a Velux window in his house which provides excellent top light - a genius tip - wish I had one!) I always grow the bush variety 'Maskotka' (tasty bush cherry type) which is always my earliest ripening tomato - sown in mid-late February it's first ripe fruits are reliably ready to pick on 1st June without fail. The variety 'John Baer' (delicious, very early large fruited) - is also an excellent variety for sowing at the end of this month. You could also sow early aubergines - 'Bonica' is without question the best ever variety for home gardeners to grow from seed - I've grown it for many years now and it's totally reliable. It came out tops in the RHS trials over 10 yrs. ago as being the best for UK and in my experience it's the best variety for Irish conditions too. Remember though that both tomatoes and aubergines need a minimum temp. of about 70deg.F/21degC. for germination, reducing the heat afterwards to approx. 55 deg.F/15 deg.C, or just below, and maintaining that level until final planting out in tunnel beds or in pots eventually. You can achieve this bottom warmth quite economically with a roll-out heated mat. For bees & beneficial insects - you could sow some single-flowered, nectar producing hardy annuals in modules now. Flowers such as limnanthes (poached egg flower), calendulas etc. will come into flower early this way and then they'll attract early hoverflies and ladybirds which help to control aphids. Early flowers also attract bumblebees and early honey bees to help pollinate early polytunnel crops like broad beans. Keep beneficial insects supplied with nectar and pollen then they'll be happy and stay with you all year. If there's no flowers for them to feed on - then they'll go somewhere else! An ecologically balanced organic garden is not just about growing vegetables! You could sow alpine strawberries. 'Reugen' is a very productive, large-fruited variety which fruits April to Nov. and will produce fruits this autumn if sown early enough. Also bulb onions, shallots, very early leeks, early spring/summer & non-hearting leafy type cabbages (collards), summer cauliflowers and autumn red cabbage. I now grow all my main-crop onions from seed sown in modules in early March - this avoids the possibility of onion white rot, which can be introduced on onion sets. The varieties I like are 'Red Baron' and 'Golden Bear' (Organic Gardening Catalogue) - which is supposed to have some resistance to onion white rot. Onion white rot is also encouraged by low soil temperatures and wet weather - sowing seeds in modules means they're warmer, have better growing conditions and can then be planted out to make a nice even bed or row with no gaps. Sowing direct in the open ground can waste a lot of expensive seed and small seedlings are far more vulnerable to attacks by slugs, and losses due to poor weather etc. Make sure that any seedlings germinated indoors or in a propagator are protected with fleece on cold nights after putting out into the tunnel - and if very cold weather is forecast also make sure to protect heated propagators with extra bubble wrap or fleece over the top at nights to preserve heat and save energy. I save every scrap of Christmas bubble wrap for this and also for tucking into odd small corners in the propagator to save heat loss! Also make sure that the compost is never too wet - if you think it may be- then draw some of it out by standing the modules on kitchen paper and newspaper for a while. Over-watering seedlings at this time of year will kill them faster than anything! An alternative way to provide heat for early sowing for anyone aiming for micro self-sufficiency! If you have enough room you could use my trick of rearing some day-old chicks under an infra-red heat lamp beneath the greenhouse or polytunnel staging! This is something I used to do every year when rearing organic broiler chickens commercially! Chicks for egg or meat production need about 6 weeks of warmth gradually decreasing until they have enough feathers to go outside on free range, so that they are weather-proof! The small amount of residual rising heat keeps the greenhouse bench just warm enough to keep out frost if arranged properly - which means you don't need a heated propagator. Killing two birds with one stone in a manner of speaking .....or rather not ..... but raising them!! Don't try this unless you're already fairly experienced with poultry though, because you can lose small chicks very quickly if they get either too hot or too cold. You also need to keep rats away - they're as bad as foxes! I find that if I get day-old chicks in mid-March - then they will reliably come into lay around the beginning of August and will then lay continuously throughout the following winter without needing any additional light. I used to rear hundreds of chicks for laying and also broiler chickens for eating this way when I was a commercial organic poultry producer - and it works very well. Most autumn planting varieties need cold weather for good root development - so in my experience at this time of year, it's really best to plant those varieties suitable for spring planting - as the seasons can be so unreliable now. We may get an extra mild spell in Jan. which would stop the autumn/winter planting varieties from developing their roots properly. If the ground is too wet and sticky - you can plant them in small pots or modules and plant them out in a few weeks time. The only garlic I've ever grown really successfully from a spring planting is 'Christo' - which I've always found very reliable. Choose firm, plump and healthy outside cloves from last year's crop, or buy certified virus-free ones from garden centres. Do not plant cloves from supermarket-bought garlic bulbs! These will most likely be unsuitable for our climate and can bring in serious diseases like onion white rot. This can survive in the soil for up to 20 years and also be spread around the garden on your boots! For the same reason I never use onion or shallot sets in the garden. If you want some extra early onions - then grow some sets in pots or containers - starting them off under cover in their containers and then putting them outside later. This way they'll be even earlier than they would be if grown in the ground because their roots are much warmer - and if you're unlucky enough to bring in any diseases with them - you can just throw the compost away into the food/green waste recycling bin rather than spreading it round the garden - which you otherwise would if you put the used compost onto your compost heap! Remember - organic growing is all about understanding your plant's needs and providing the very best growing conditions for them in order to minimise the risk of pest or disease attack as far as possible. This is exactly the same whether they are vegetables or ornamental plants. Things like like mustard and cress, radish, broccoli, kale etc. are easy to grow in jars or trays. Sprouting seeds are highly nutritious and can be a valuable addition to winter salads - young seedlings are actually higher in health promoting phytonutrients than older plants. Broccoli sprouts are particularly rich in these. Make sure you rinse them well and very regularly though if they're in jars - at least 2/3 times a day, with filtered water, to avoid bacteria or disease building up. I actually prefer growing them in trays on kitchen paper or compost, much in the same way all school children grow mustard and cress. They will often need watering twice a day even at this time of year in a warm kitchen, particularly as they get a bit bigger. It's very important to use organic seeds for doing this - as these will not have been treated with potentially harmful pre-emergence fungicides (these seed treatments are forbidden under organic standards). It's time to get on the starting blocks! Spring is only just round the corner! So if you haven't done seed orders yet here's another reminder - ORDER THOSE SEEDS NOW!